Insulated fish bags are growing increasing popular in the marketplace. They provide a portable means to protect, ice, store and transport your catch. 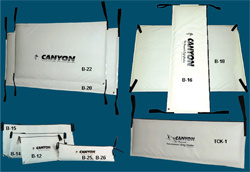 While other insulated fish bags have hit the market in past years, the Canyon fish bag has remained superior. We have the only bag in the market with a heat-sealed, leak proof construction. The materials we use are nothing but the best. The bags are made from heavy-duty, fiber interlaced PVC skins with superior insulation. We include 12" long looped heavy webbing handles for ergonomic mobility and mounting flexibility. Bags also include a drain with a hose fitting for easy cleanup. We offer the most size and construction options, and offer custom sizes and lettering. • Our fish bags are the only bags on the market with leak-proof heat sealed construction that keeps your boat clean. • Heavy-duty, fiber interlaced PVC skins with superior double layer, closed-cell foam insulation. • Bags can be hoisted up to conserve cockpit space. • Sturdy 2" webbing handles. • Bags include a new single piece drain design for easy cleaning. • Most models available with track and bead to mount to transom. • Bags include Stretch & Store strap for storage and roll up compactly. • Heavy duty marine grade zipper. • Enjoy fresher fish, or get more $'s for your catch by preserving your fish.